If you’re joining us from the Get Kids Crafty! May blog hop, you know the theme is gardening. Thanks for hopping along with us; Kelly and I are excited to share our creations with you! We have been busy making shaker cards this week. 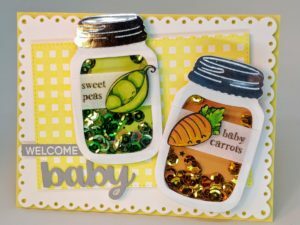 I’ve made several recently and, Kelly was so inspired, she wanted to make a shaker card of her own. This is her first attempt and it turned out great! She used the Ready, Set, Snow add on dies from Lawn Fawn to cut out her snow globe frame and dirt mound. 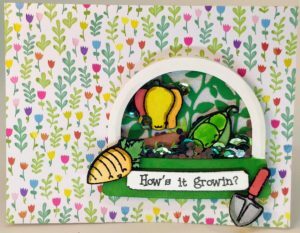 She also added a die cut layer of grass and some leaves to her shaker background. She stamped and embossed her focal images from Happy Planting and colored them in. She used the Scan N’ Cut to cut them out and added Wink of Stella for some shimmer. Her sentiment was cut with a die in the Ready, Set, Snow set. Then she assembled the whole thing with liquid glue and a double layer of foam tape. She used a variety of sequins as filler. Once her shaker was assembled, she glued it to the front of a pre-made card base. What do you think? Pretty impressive for her first try, right? 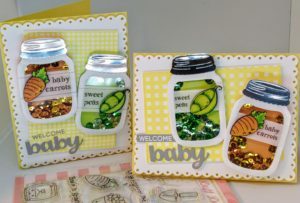 I die cut four jars, two from white cardstock, one orange, and one green. I freehand drew and cut a window in the white jars and added acetate. I mounted foam tape behind the windows and added color coordinating sequins before sealing them to the orange and green jars. I die cut lids from silver cardstock and glued them on top. For a little added dimension, I used a grey marker to add shadows to my jars. 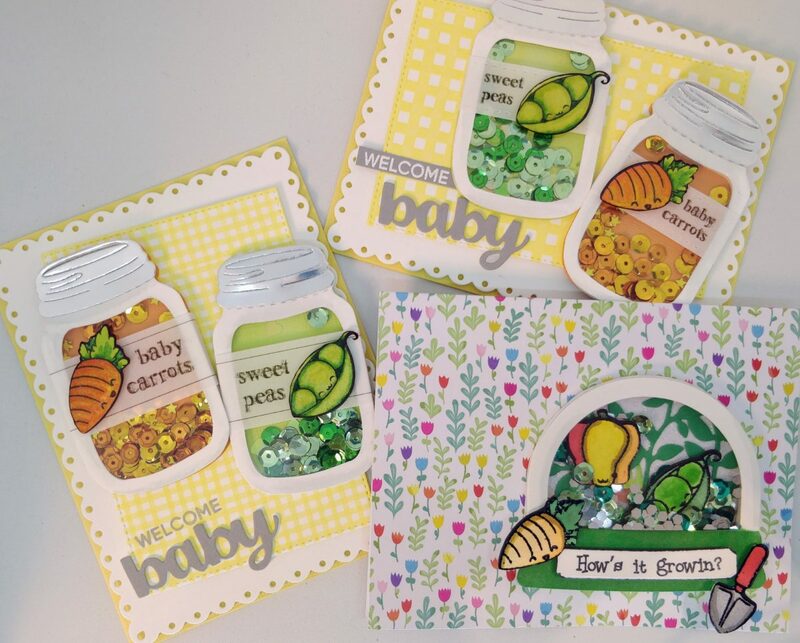 To make the labels, I printed “sweet peas” and “baby carrots” onto vellum, using my computer and printer. (You could also do this with alphabet stamps.) I cut the vellum strips out and wrapped them around the jars, only adding adhesive to the back side of the jars. 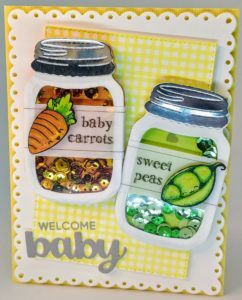 I stamped my peas and carrots, colored them, then fussy cut them with my Scan ‘N Cut. I outlined the edges with a black marker, added a little Wink of Stella to jazz them up some more, and popped them onto my jars with foam tape. 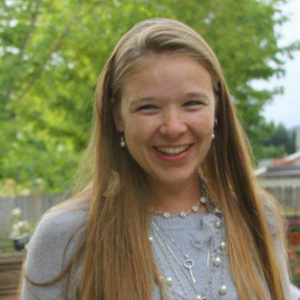 LOVE THIS Amanda!! Awesome job!